Plantar Verruca (wart) are common, contagious lesions on the soles of the foot, caused by the human papillomavirus (HPV). They can be quite painful and usually multiply if left untreated. 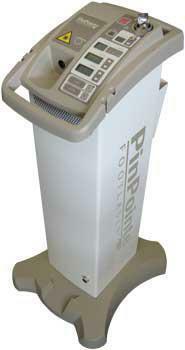 The newest and most advanced treatment available for plantar warts is the flashlamp pulse dye laser. The procedure allows the patient to remain ambulatory throughout the course of the treatment and recovery. With minimal surgical or post-surgical pain, the procedure is well tolerated by apprehensive patients and children. The pulse dye laser simply seals off the blood flow to the wart, therefore, cutting off its nutrient supply. There are no open lesions, thereby lowering the risk of infection and scarring. The laser produces a small zap of heat that lasts only a few seconds resulting in a sensation that patients describe as similar to a snap of a rubber band. Anesthesia and analgesia are typicallly not required and there is no post-operative care involved. The procedure is performed in the office and patients are able to return to activities immediately. The PinPointe FootLaser, which is approved by FDA, is a specially designed laser beam that goes through the toenail and safely reduces the infection in the nail bed that causes Onychomycosis — more commonly known as toenail fungus. The procedure requires one safe, quick treatment, with little or no discomfort and is performed in the doctor’s office with no anesthesia. The gentle laser light beam has no effect on healthy tissue and treats only the infected area. No drugs or topical ointments are used, eliminating the total-body side effects of traditional oral medications. Clinical studies show that PinPointe FootLaser reduces fungal infection and promotes clear toenail growth with a single treatment. PinPointe FootLaser is safe, effective and most patients improve after their first treatment. Introduced in 2008, PinPointe FootLaser uses a patented laser technology to target the pathogens that cause toenail fungus. With PinPointe FootLaser, patients are treated safely and quickly with no drugs, no anesthesia and no pain. PinPointe’s laser light passes through the toenail without causing damage to the nail or surrounding skin. Following the procedure, the new nail will grow in healthy and clear. Unlike medication-driven treatments for toenail fungus, PinPointe FootLaser presents minimal risk of side effects. Competing medication procedures can result in a wide variety of side effects, including liver toxicity. The CO2 laser is used on ingrown nails, warts and other skin lesions. For ingrown nails the CO2 laser uses a high energy light beam to burn part of the nail matrix. The laser sterilizes as it works so there is also lower risk of infection. Once done the matrix (growth center) has been partially removed so there are very low incidences of recurrence. Dr. Eichelsdorfer recommends use of the CO2 laser for ingrown nails because there is less pain, faster healing, and is more precise than other methods. For warts it is used to cut and vaporize the wart. Cutting around the lesion will allow a complete excision of the wart while cauterizing the blood vessels. Defocusing the laser or making small streaks with the laser over the body of the wart will vaporize the lesion and create a mild burn or blister. This will evoke an immune response within the body which will help heal the wart from the inside out. Using the CO2 laser leaves less of a scar. The laser scanner is able to obtain highly accurate images of the foot using white light and digital camera technology, creating precise orthotic fabrication. Patients are given specialized socks to wear while being scanned in our office. Orthotic style is customized to the patient’s condition, activities, and type of footwear. 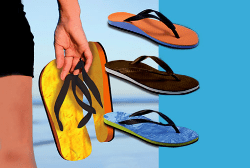 Custom Flopthotics give the support of a custom orthotic in a flip flop. Patients are able to choose the sole, base, and top cover color creating a unique color combination.